Looking for a way to geotarget Elementor content on your WordPress site? 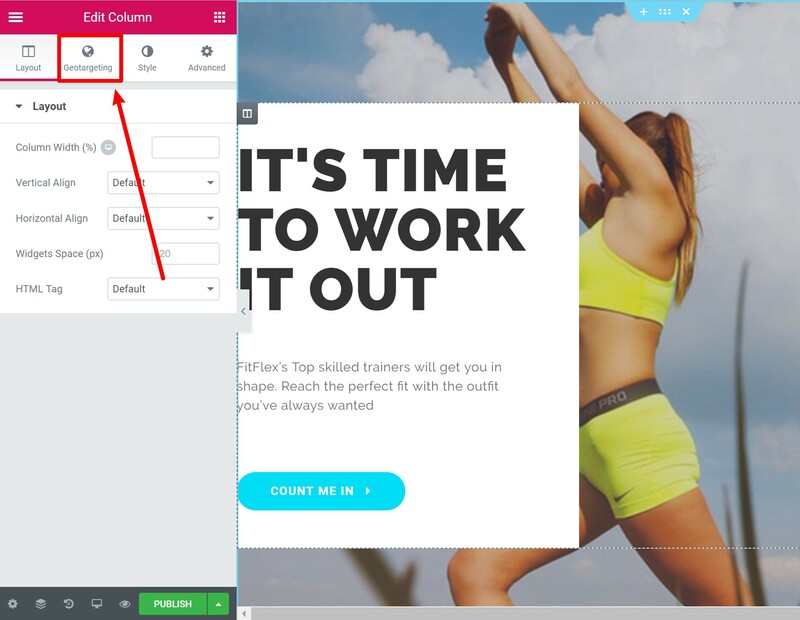 In this post, you'll learn how to geotarget individual Elementor widgets, columns, or sections right from the regular Elementor page builder interface. That is, you can display one Elementor widget to a visitor from Germany, and a different widget to a visitor from the USA. Or, you could geotarget an entire section and all the widgets inside. With this functionality, you'll be able to create unique Elementor experiences that are tailored to each individual visitor's location. In order to geotarget Elementor content, you'll need the Geotargeting Pro plugin from Geotargeting WP. Geotargeting Pro has a built-in Elementor integration that lets you geotarget your Elementor content to any country, state, city, etc. There's no need to learn a new interface or add a new workflow, either - you'll do everything right from the normal Elementor side panel. 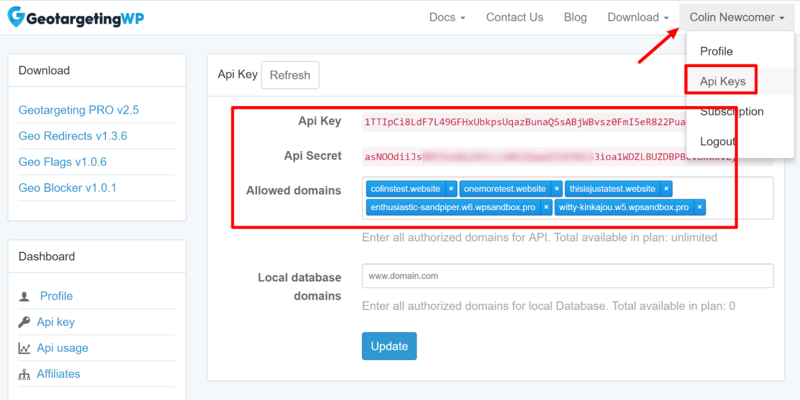 Or, you can also geotarget entire pages that you've built with Elementor. In order to use the Geotargeting Pro plugin, you'll need to subscribe to the Geotargeting WP service. 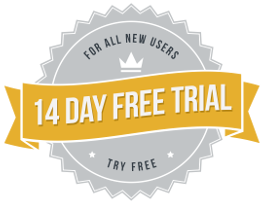 However, Geotargeting WP offers a 14-day free trial, so you can follow this tutorial without spending a dime. 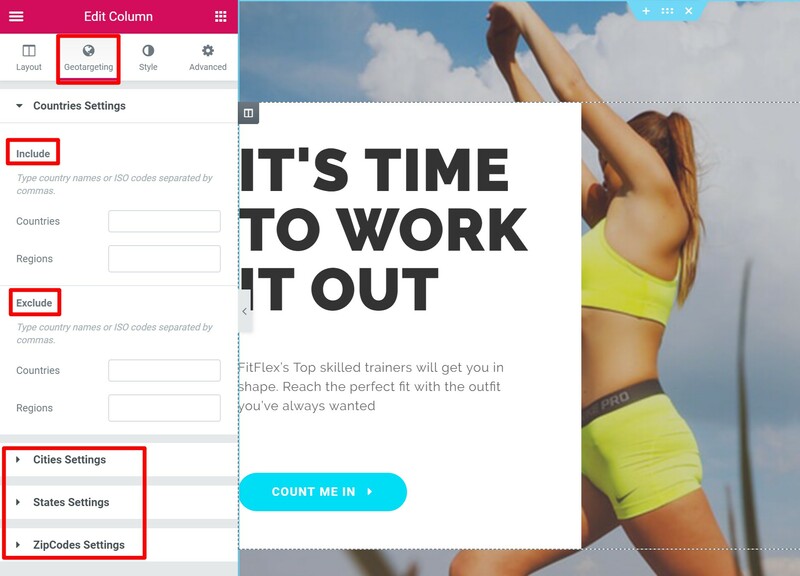 To get started, sign up for your Geotargeting WP account (remember - you get a 14-day free trial to test it out). Then, download the Geotargeting Pro plugin from the Geotargeting WP site and install the plugin at your WordPress site. Now, you're ready to geotarget Elementor content! Once you activate the Geotargeting Pro plugin, it automatically integrates itself into Elementor to help you start geotargeting content. 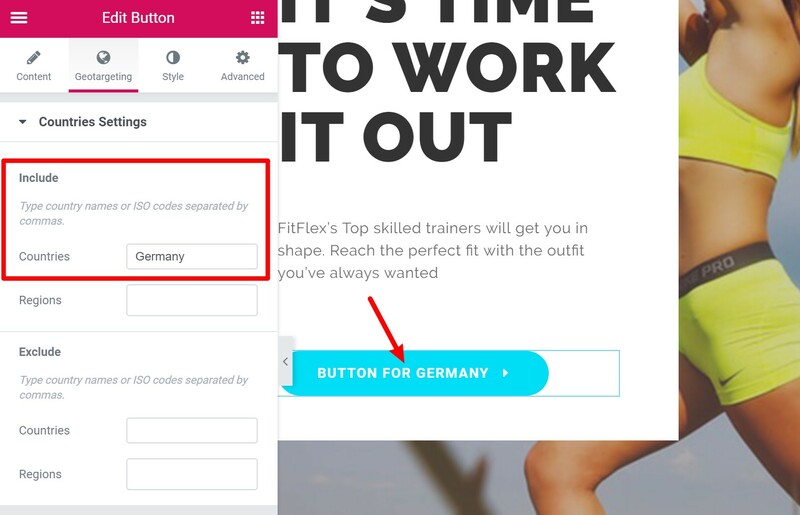 Let's say you want to create two buttons - one for visitors from Germany, and another for visitors from anywhere else (except Germany). And that's it! 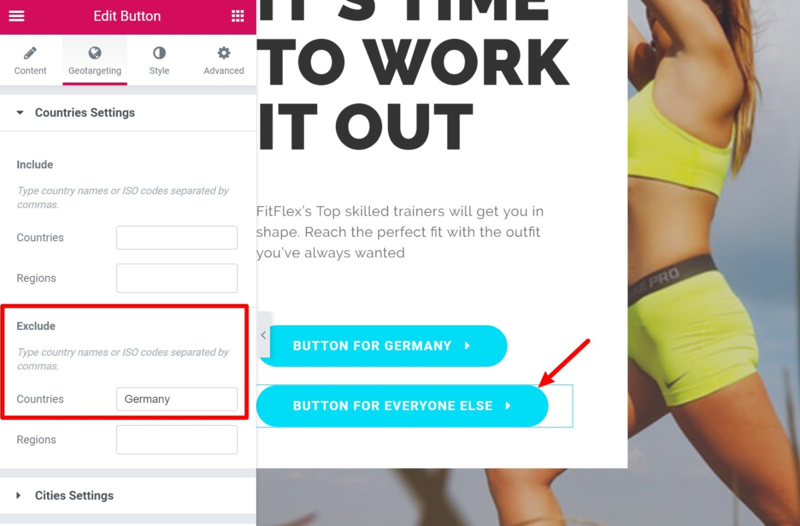 German visitors will see one button, and everyone else will see the other button. Using this interplay of include and exclude rules, you'll have pinpoint control over the geotargeting for every single Elementor widget, column, or section. Note, if you're interested in how to geotarget entire posts or pages built with Elementor, check out our general post on how to customize WordPress content based on location. Any Questions on How to Geotarget Elementor Content? That wraps up our guide on how to display different Elementor content based on a user's location.